There is a '+' on the top left of the main map. This is the directional keypad for you to navigate and scroll around to see different portions of the State you are in, as shown by the 4 direction arrows. 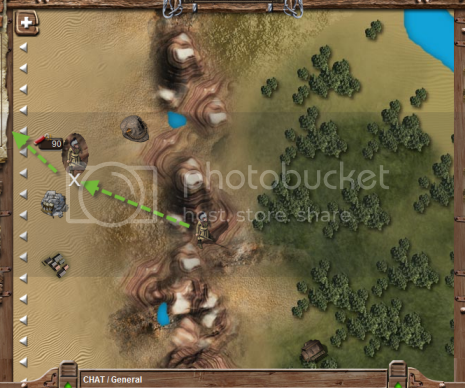 - The human figure at the center of the arrow keys allows you to center in your character if you fail to locate it on the map. - The plus and minus sign below the arrow keys allows you to zoom in/out. Alternatively, you can left click on your mouse on any portion on the main map, hold the left click and drag the map around to see other parts of the state. 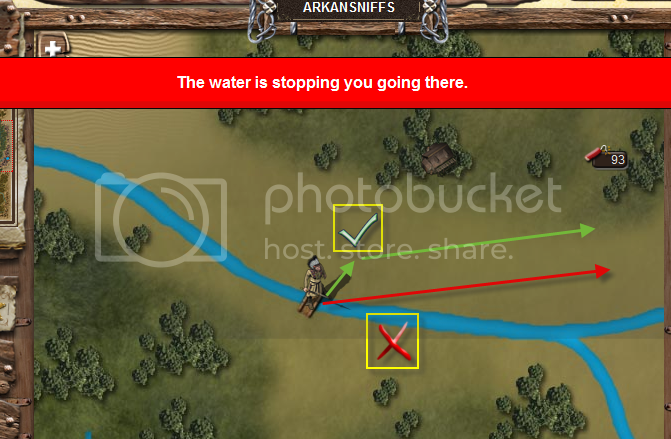 Note : Be careful not to let go too abruptly or your character might travel to the spot you clicked (barring no rivers needed to cross over), causing you to lose energy for the travel. 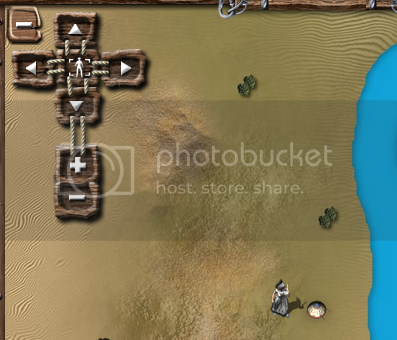 By clicking the mini-map on the left side of the page loads it in the main display. This allows for travel by foot/mount (if equipped with one) to various locations on the state, between states and towns/villages by clicking on the main display. The expanded map shows the entire state you are currently at, of which will change when you cross to another state. Travelling requires energy. You will require a significant amount of energy to travel according to the distance you need to cover. 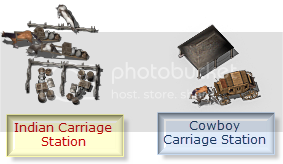 You can buy mounts from the shop or markets which can reduce cost of travel. Some of them requires your character to be of certain level before you can mount them though. 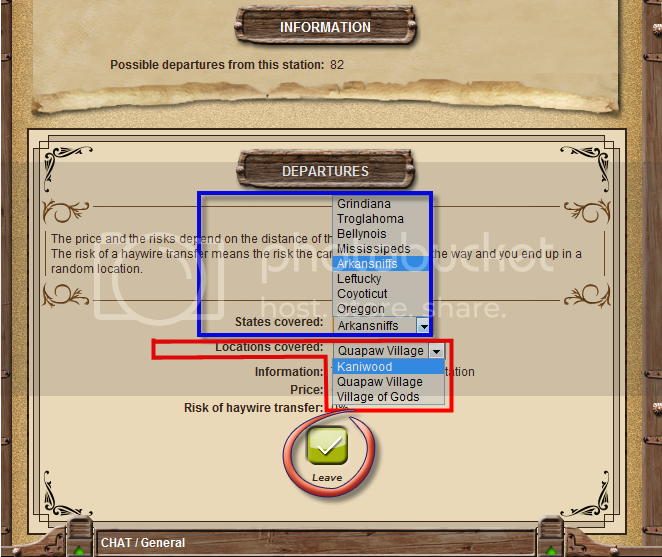 Travelling is intuitive - as shown in the tutorial if you had gone through it. 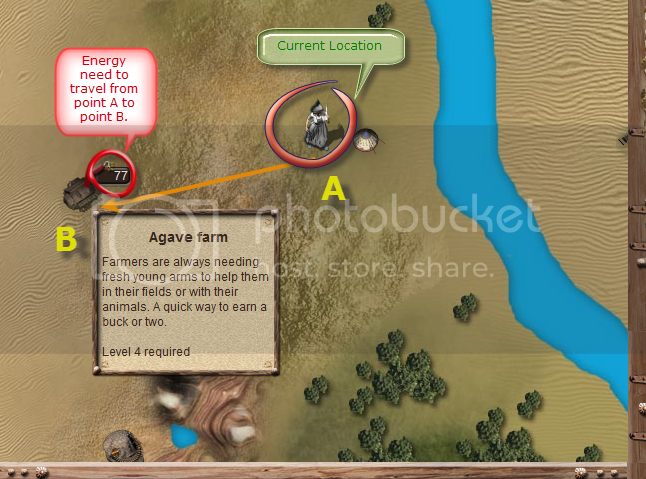 Hover you mouse pointer over any point on map shows the energy needed to move from your current location. Clicking on the point you wish to reach will move your character to that point. 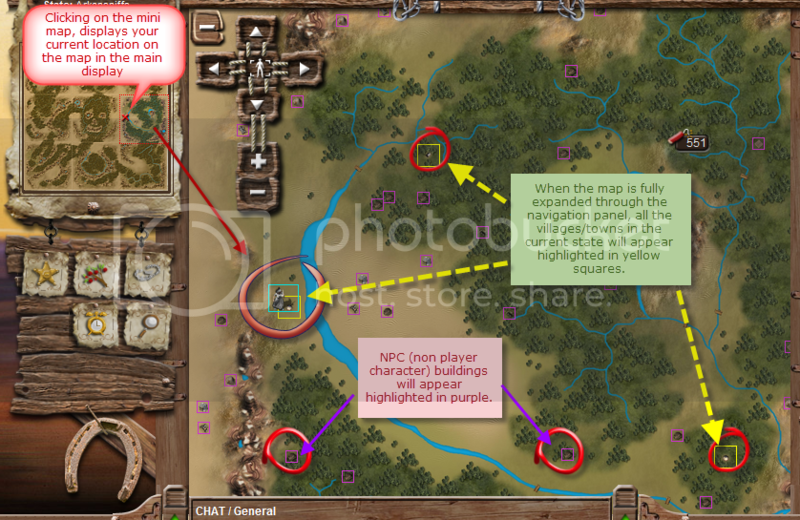 Your character moves in a straight line as indicated above so any point which touches a body will result in you not being allowed to move to the point you wish, for example, across the river to the town on the opposite end. To do so , you have to cross the water body using the bridge nearby. Moving onto the bridge will allow you to cross the water body successfully and towards the your destination. 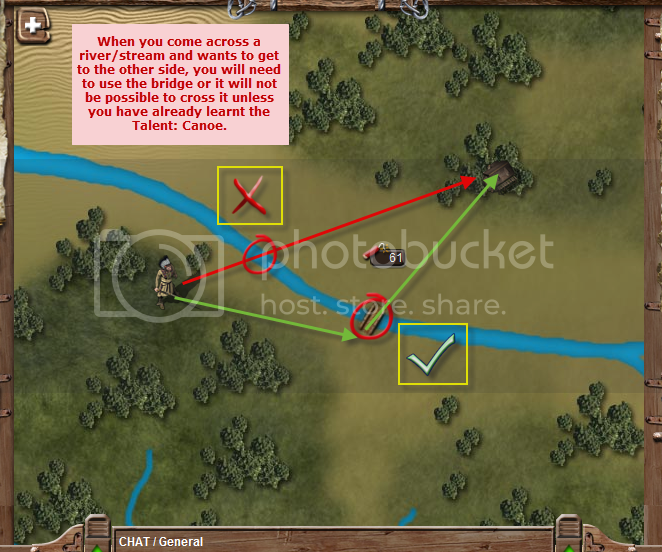 Even if you are on the bridge itself and crossing the river, your 'line of travel' to the destination point may still touch the waters as above , so it is best to cross the bridge right to the other end towards land again and proceed to the village. You wish to cross to the State to the left. 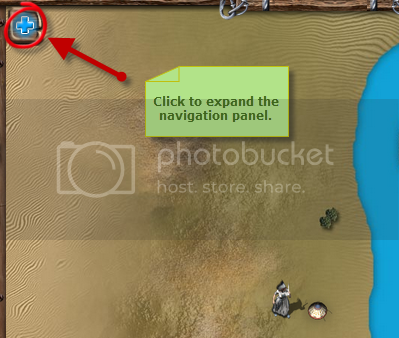 Hover your mouse at the edge of your current State on the main map and the white arrow border will appear, when zoomed in the border only appears on the left side or the top of the main display. If it does not show up, that usually means you are not at the edge of the State map - use the directional navigation keys to click to the extreme left of the map. 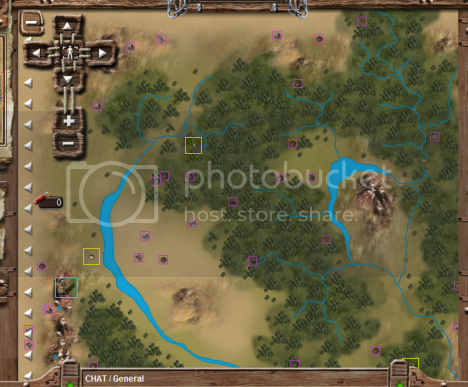 Next , when you see the white border showing up, move your character to the close to the white border line as shown. Then, cross over to the left of the white border. Note: Wait for a moment, and your character should appear on the neighboring State after crossing the border as shown below. You can then proceed to zoom out to view the surroundings. If your Town has either of the above Carriage Station built and functional , you may use it to travel between various Towns without using any energy but it will cost you some money. The above will show up after entering the carriage station in your Town. Depending on how well the owner of the building repairs the building and which upgrades are chosen, you may have a selection of States and their relevant Towns as destinations. Take note that you have to pay a travel fare for the trip.